Friday night, I submerged myself into the heart of whiskey culture, breathed it in and felt right at home. The “6th annual Whiskey In The Winter,” is a jammed pack, wall-to-wall bourbon, scotch, and whiskey festival. The event is one that sells out early, and for good reason. Simply, put there is nothing else like it in St. Louis. WITW, continues to bring out the best it can for the local whiskey sippin’ population. A true mix of local, regional, national and international brands all in one room. All told, 400 individual whiskies being poured, special whiskey cocktails crafted by this town’s finest mixologists, real dinner stations featuring whiskey inspired dishes and desserts, educational seminars and even straight blade shaving chairs for those who aren’t afraid of spilling a bit of whiskey on that clean, close shave. Per my earlier article, The award winners and I’m sippin’ them all, I made a plan and stuck with it. 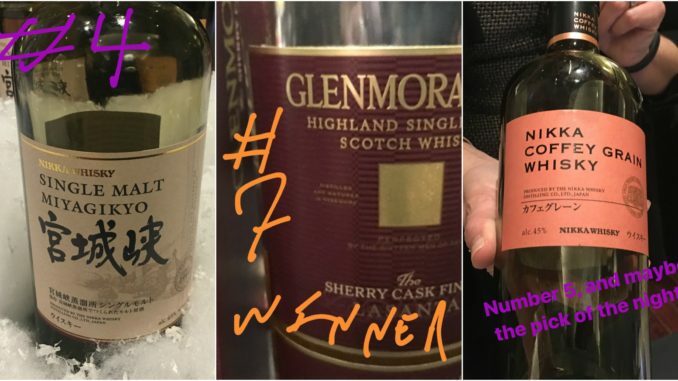 Sadly a few of the award winners I hoped to sip, did not end up being offered, so I learned a lesson there too – no pour list is every set in stone. I ended up improvising. If a distillery was not pouring their award winning whiskey, I tried what they had anyway. Entering the main room, it is literally wall-to-wall spirits. In past years, seeing all this whiskey was a bit overwhelming, but now, knowing my plan and sticking to it makes that entire feeling just disappear. So even with the biggest names in spirits staring at me, beckoning me, I stay true to my word I stuck to my plan and found my first stop. So remember, they only pour a little bit, so they don’t give you much to work with, but I’ll do my best to give you a fair memory of what I sipped. In my shot glass, it pours a nice amber orange, just a tad hazy. A hint of spice on the nose. Maybe a hint of fruit too. Sweeter than I was expected. And that spice is there as well. Kind of earthy and dare I say chocolatey. Up till now, I’ve only had the traditional Elijah Craig. This was a complete departure from its cousin. I’m still learning how to read what I’m smelling when it comes to whiskey, but this one helped teach me how to recognize vanilla and oak. The woodiness is real and offers a nice set up for the tongue. Again that woodiness was right there, along with notes of that vanilla and even maybe some chocolate or caramel. At the time I tried this bottle, it was my surprise of the night. As I said in my post, it really explodes on the tongue and wakes up your mouth. I got excellent fruit on this one, with a bit of sweetness mixed in. There is some heat with this one too, a slight burn, but nothing unpleasant. This was my first slight disappointment of the night. Poured gold and clear, and gave me a hint of lemon on the nose. It was a very light whiskey, lighter than I’m used too, so to be fair, I think I’ll need to try and learn more more a lighter whiskies, but for now, it was not one I preferred. My fourth whiskey quickly came move to the top of my ‘take home’ list. Let me explain. My neighborhood bottle-shop / liquor store, Randall’s Wine and Spirits, is also on hand, offering a healthy 20% discount on just about any bottle in attendance. I have made it a fun tradition to select one bottle to ‘take home’ by the end of my evening. This was my first try of Nikka Whiskey, and now I know what I’ve been missing. This single malt has been described as an ‘entry point’ into Nikka’s portfolio and they were right. 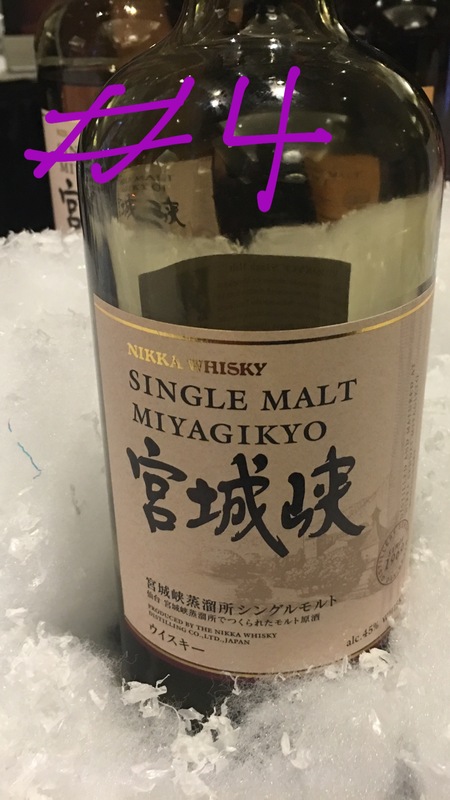 Like, Dogfish Head’s 60 Minute IPA, became my working example of a ‘balanced’ IPA, Single Malt Miyagikyo is now my base for ‘balance’ when it comes to single malts. 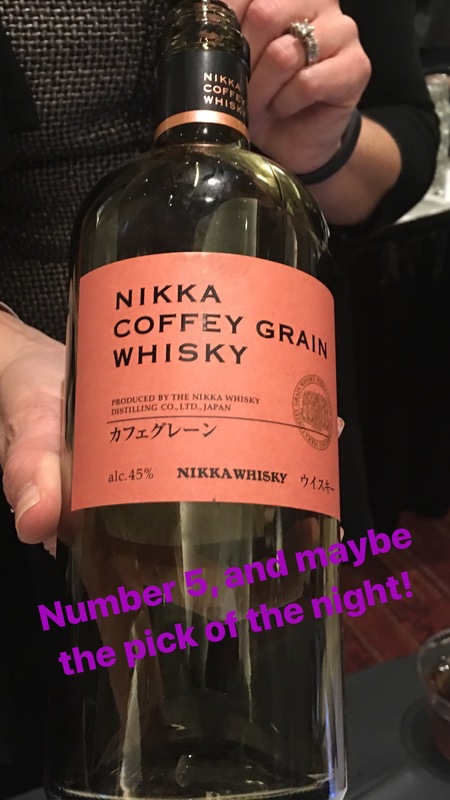 Normally, I move on after a sampling from one distillery, but I enjoyed this one so much, that I went back immediately to try a second offering, this one, Nikka Coffey Grain. As the rep pointed out to me, the trick here is the spelling of Coffey. It is not a ‘coffee’ whiskey. Coffey is a nod to Irishman Aeneas Coffey who patented his column still design in 1830. This whisky was silky and smooth and a tad bit on the fruity side. I was very impressed with Nikka’s offerings, and in fact, coincidentally, this morning (Sunday) the distillery just happened to be featured on CBS Sunday. Unknowingly, I seemed to be trying more single malts then I planned, but such is life at Whiskey In The Winter. This bottle won a Gold Medal at this year’s Irish Whiskey Masters. It was also a bottle that was recommended to me by a friend. Only available in the U.S. since 2015, this is a non-age statement made from 100% Malted Barley from a range of different ages including Malt whiskey distilled in 1991. The whiskey is matured, or vatted in 5 different wine cask (Sherry, Port, Madeira, White Burgundy, Cabernet Sauvignon) finished Irish Malt whiskeys. 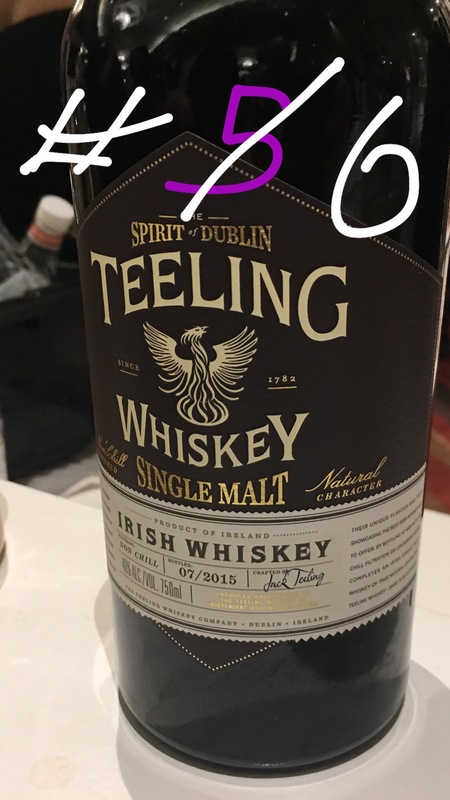 And according to their website, like all the Teeling whiskeys, it is bottled at 46% with no chill filtration allowing all the natural flavours of the whiskey to be retained. No-Chill is something I’m going study up on, because I think I like the outcome. There were three Glenmorangie whiskeys on my list and the fellows at the were happy to hear it. This bottle won the award for Best Highland Single Malt at this year’s World Whiskey Awards. 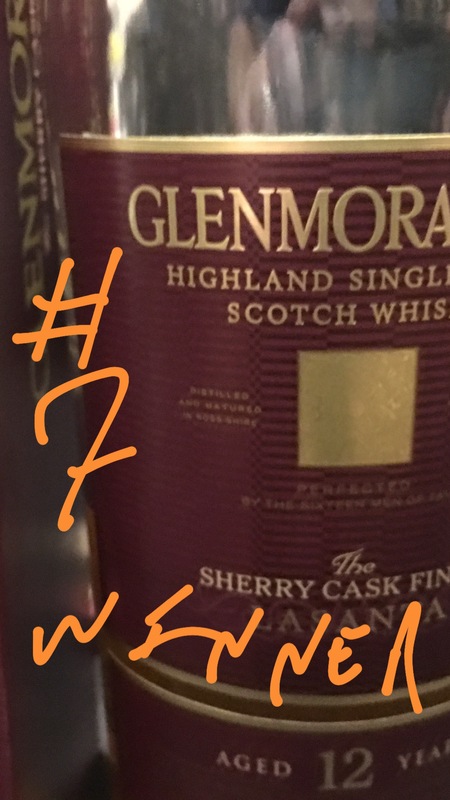 In discussing this bottle, I learned that the whiskey begins as Glenmorangie Original, but is aged two additional years in sherry casks to become Glenmorangie Lasanta. So to check out the difference I did a side-by-side tasting. Lasanta is darker in color, richer, fruitier and spicier and I really did get the sherry sweetness from the casks. 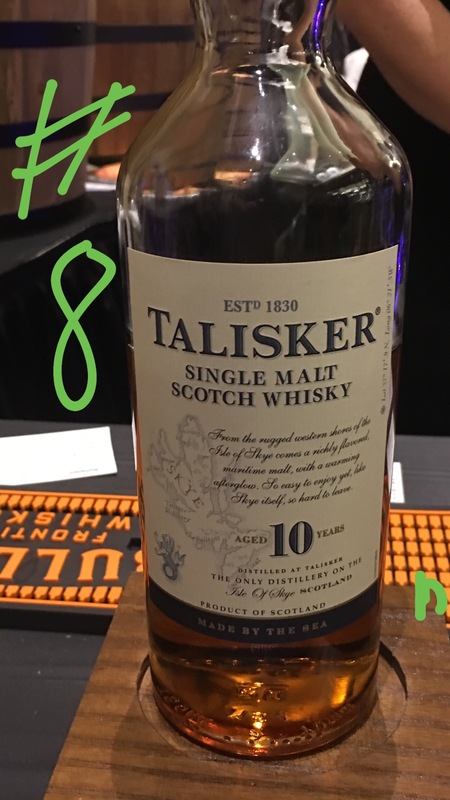 I’ve heard of Talisker for years, and had built this bottle up in my head as something to behold, but frankly I didn’t care for it. The entire swig just didn’t agree with me, but that is okay. Not every whiskey is going to be for everyone. I know there many out there who adore this bottle, but for me it was not something I would buy or try again. And finally, after so many single malts, I felt I needed to get back to some bourbon and whiskeys. 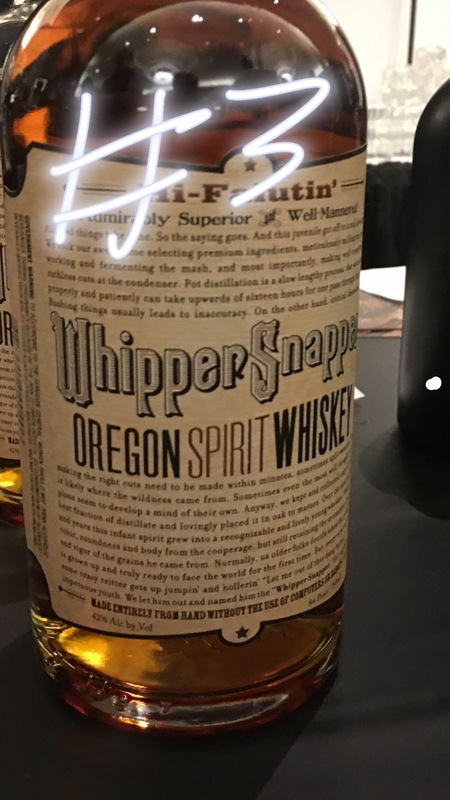 I tried some outstanding samples from some of the biggest U.S. distillers. 12-Year Old World Cask Finish Rye Whiskey from Whistle Pig. 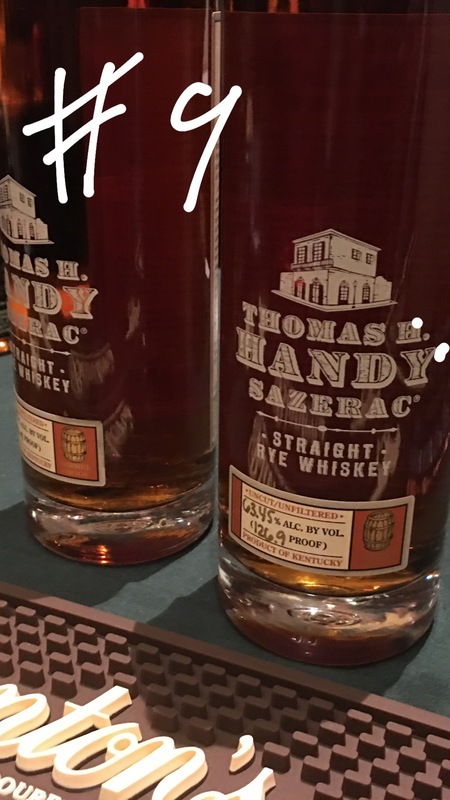 And to wind up my night, I decided to tip my cap to old New Orleans and the original Thomas H. Handy Sazerac Rye, of which I do make a very splendid Sazerac.